Students during the celebration yesterday in the main square of the campus. 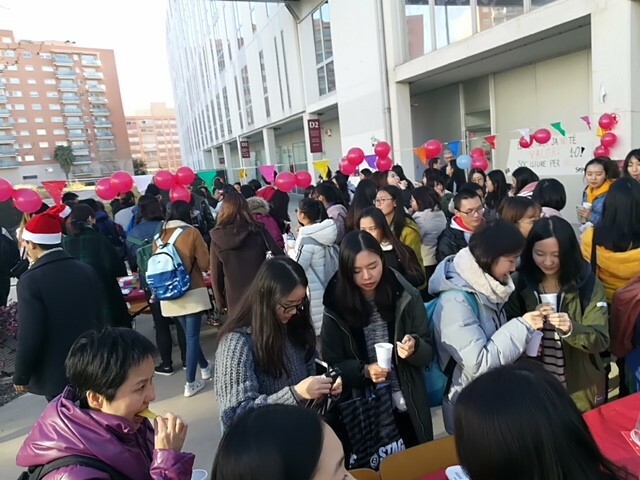 For several years now, Chinese students studying on the URV’s programme in Spanish language, culture and business, along with their teachers, have participated in the Christmas party organised by the Centre for Hispanic Studies. The party took place outside in the main square of the URV’s Catalunya Campus and featured Christmas greetings, a photo call to record the moment and a traditional buffet with nougat, biscuit rolls and panettones, which the students bought themselves so they could experience how Christmas is celebrated here. At this time of the year, the students are studying for their exams in January and also take the opportunity to visit other parts of Catalonia and Spain. Their own equivalent celebration is the Chinese New Year in February, which is also marked by celebratory events at the URV.